Knutson was a standout teenage swimmer who turned professional straight out of high school. 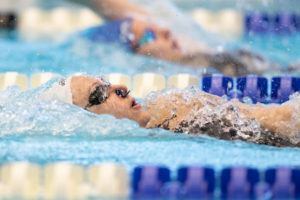 She moved to California to join USA Swimming’s budding ‘Center of Excellence’ within Fullerton Area Swim Team, or FAST. 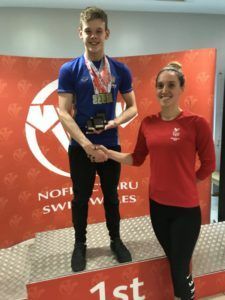 Knuton, along with fellow pro Kate Ziegler, were told at the time by then-USA Swimming National Team Director Mark Schubert that USA Swimming would cover their tuition plus room & board to a local college along with their training expenses. But Schubert was let go by USA Swimming, and in the changeover at his position, USA Swimming told Knutson and Zeigler that only some of those expenses would be covered. Knutson and Ziegler connected with attorney Richard Foster, who reached out to USA Swimming on their behalf to procure a better deal. But Knutson has said Foster failed to disclose to her that he had previous relationships with USA Swimming brass, enough to constitute a conflict of interest. Foster was the former president of USA Water Polo, had represented Schubert legally and was a longtime friend of USA Swimming President Chuck Wielgus. Foster admitted as much in an e-mail obtained by The OC Register. Foster did come to a deal with USA Swimming on behalf of the two swimmers, but Knutson says that deal was far worse than what the two were originally promised. 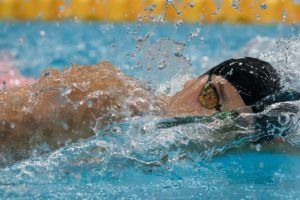 The new model was tied heavily to the swimmers’ world rankings – and as Knutson struggled with depression and an eating disorder over the next few years, the returns diminished and the deal was eventually terminated. Knutson sued Foster for failing to disclose his conflict of interest, and in June of 2016, a jury ruled in her favor, holding that Foster had committed a breach of fiduciary duty and awarding Knutson more than $600,000 in damages. But by early 2017, a judge threw out that verdict, saying the original trial had “erred by applying an incorrect legal standard for causation in granting a new trial,” per The OC Register. In other words, the judge found that Knutson and her attorneys had failed to prove that someone other than Foster could have negotiated a better deal on her behalf, and sent the case back to trial with that extra burden of proof for Knuton to meet. Foster declined to comment to The OC Register, but did indicate that he would be filing a petition for rehearing. You can read the full court of appeals opinion here. I’m happy for Dagny! I hope that she is well and winning her battle with her eating disorder. This story leads me to think USA Swimming is a corrupt organization. USA Gymnastics was corrupt. I don’t want to believe Swimming is like Gymnastics. This article doesn’t lead me to think otherwise. I hope Dagny gets justice and the same for Mr. Foster and the rest of those involved, regardless. Uh, ya think? Corruption and greed at the highest levels. USAS is trash just like FIFA, IOC, USOC, USAG, et al. They are all run by greedy white men with no regard for athletes. The stories of depressed, addicted, and otherwise cast-off former pros are adding up. Hope she can get paid every penny. It seems USA swimming has always been particularly aware of how young some of the female stars in particular have been when they hit the scene. Instead of protecting them, we are seeing multiple instances where in some way or another coaches and leadership failed.